No More Dirty Clothes on the Floor! 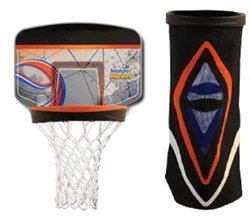 Get your kids to slam dunk their laundry into this basketball laundry basket! Hamper Hoops by Wham-O, as seen on TV, is the super fun way for kids to pick up their dirty clothes off the floor and put them into the hamper- slam dunk! Hamper Hoops fits on any door. Remove the laundry bag and now you have a basketball hoop!